It’s been close to a month since Microsoft released Windows 8.1 RTM update to the public. Microsoft’s newest version of Windows operating system, which includes over 50 new exciting features, is an attempt to improve the previously released Windows 8 version and is available as a free upgrade to all Windows 8 users. Users who have been using Windows 7 and previous versions of Windows might want to test drive the latest offering from the software giant before making the final call. 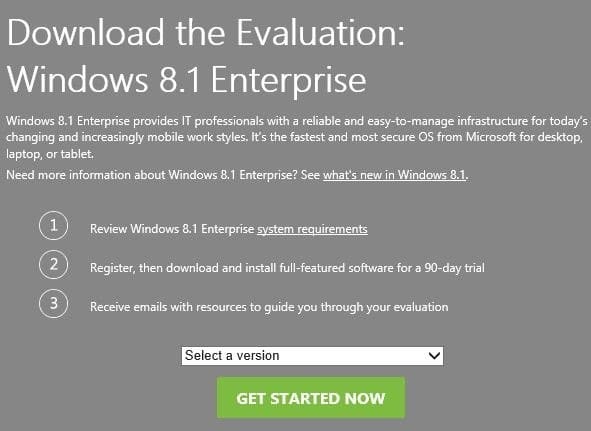 To help all users install and experience Windows 8.1 OS, Microsoft has made available for download a 90-day evaluation copy of Windows 8.1 Enterprise edition. In addition to all features available in Windows 8 Pro edition, the Enterprise edition include some features designed for business, such as Windows To Go, App Locker, BranchCache, Virtual Desktop Infrastructure and more. As with Windows 8 and Windows 8 Pro editions, the Enterprise edition is also available in both 32-bit and 64-bit versions. You could either download 32-bit ISO or 64-bit ISO from the download page. If you plan to install it in a virtual machine or a PC with less than 2GB of RAM, we recommend you download the 32-bit ISO, as the recommended RAM for x64 Windows 8.1 is 2GB and requires more disk space when compared to the 32-bit version. According to Microsoft, you need at least 20 GB of free space to install 32-bit version of Windows 8.1 and at least 20 GB for 64-bit version. To download the 90-day trial copy, head over to link mentioned at the end of this article, select the version of Windows 8.1 (32-bit or 64-bit) that you wish to download, click Get Started Now button, sign-in with your Microsoft account (Hotmail, Live, MSN or Outlook), provide the basic information such as the purpose of downloading the ISO copy & your current Windows version, and then click Continue button to begin downloading the ISO image file. Once the ISO file is downloaded, you need to prepare a bootable USB or bootable DVD by burning the ISO file. Note that if you plan to install the downloaded Windows 8.1 in a virtual machine, you don’t need to prepare a bootable media and can follow the instructions in our how to install Windows 8.1 in a virtual machine guide for step-by-step instructions. i will trail windows 8 for my future so please download trail version.